Traveling is always a ton of fun, but there’s something so comforting about coming home to your own bed…and fridge. Last week we went to visit my parents just a few hours away in Springfield. It was our 6 month old’s first mini road trip, and it went amazingly well. I was a bit unsure because she tends to dislike cars, and doesn’t take a pacifier… so I was kind of bracing myself. But guess what? She slept nearly the whole time! It was such a relief and she continued to so well the entire trip. 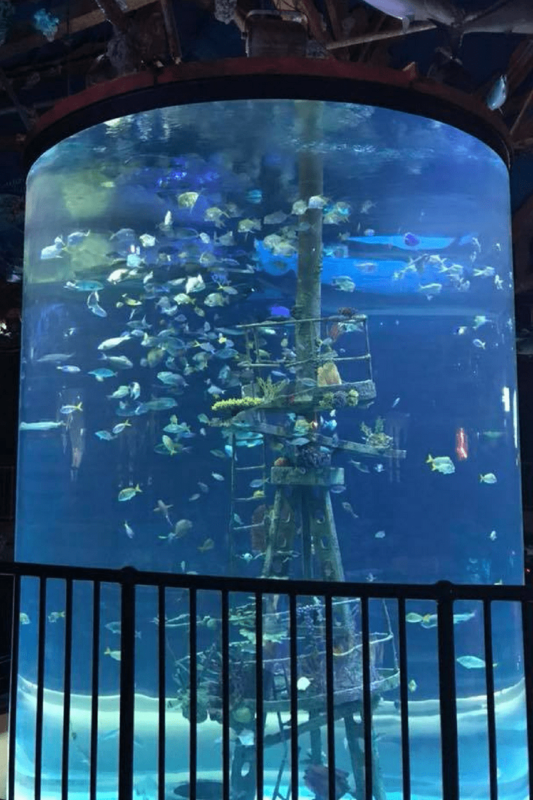 We all had a fantastic time, ate delicious keto food, and went to an aquarium! Wonders of Wildlife, which just opened last month. Real talk, I have been waiting for this place to open since I was a kid. Literally. It took FOREVER for them to finally build it. We went early on a rainy Sunday morning, before it had a chance to get crowded. My absolute favorite part? 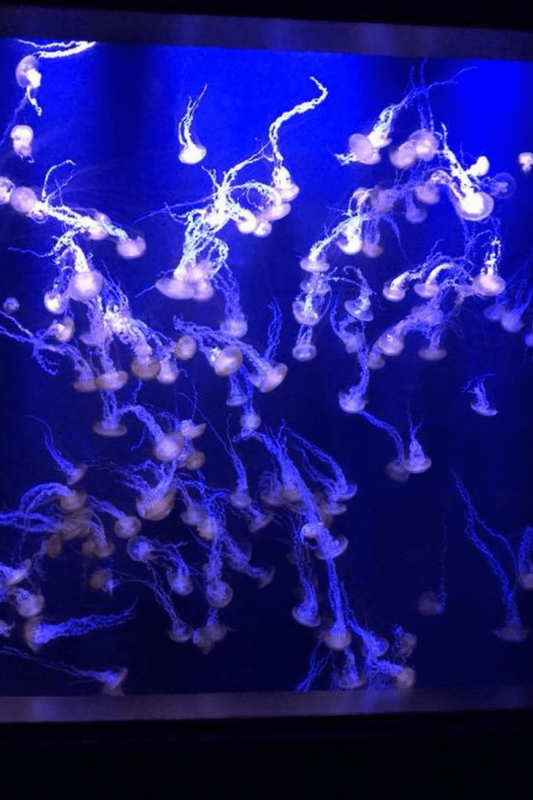 The jellyfish. They were mesmerizing. Since we have two kiddos no, we had even less time to sit down and eat. My husband and I have been more into Intermittent Fasting lately or, IF. I started doing 16/8 which means 16 hour fast with an 8 hour eating window. You can read more about the benefits of IF here. During our trip, and a couple days before I naturally shifted into 20/4. Doing IF during while traveling made things much easier. The kids had to eat frequently as usual, but my husband and I just waited until we got back to the hotel at night and had a feast! It was so much fun. Grocery store rotisserie chicken, Qdoba bowls, pickles, tons of almonds and wings out the wazoo. As good as all that food was, it was still super nice to come home to our own fridge. No studying nutrition labels, or strategic food planning…just a bunch of food we’re used to that we know we can eat and enjoy. Some time during the second half of our trip fall arrived. And it came HARD. By the time we got back home it was COLD, going from highs in the 80s to lows in the 20s in just a few days. Cold weather calls for warm meals. And chili is one of my favorite fall dishes. Sometimes it’s hard for people to understand how you can enjoy chili without beans…but it’s easier than you might think! Throwing in some extra chicken and veggies adds even more flavor. It’s not as thick as traditional chili, but it’s loaded with flavor…and I promise you it’s filling! You can even add one of my keto dinner rolls on the side. 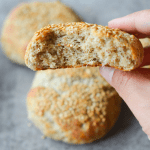 They taste like a wheat roll to me, and can be made in less than 15 minutes while the chili cooks. 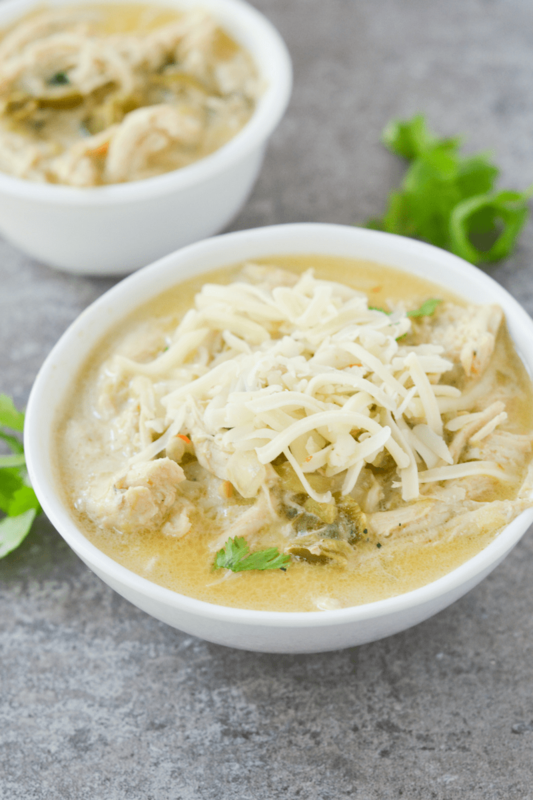 All the extra fats in this white chicken chili will help keep you full without all the carbs that beans carry. 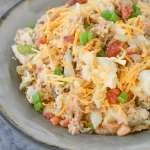 This is also an excellent meal to make in the crockpot AND the perfect freezer meal. Just put it in a large freezer ziplock bag and when you’re ready to make it put it in a bowl of cold water to thaw it out. Once it starts getting soft, put it in a large pot on the stove, add a little salt, and warm it up. As a bonus you can throw in some herbs like cilantro to help freshen up the dish. 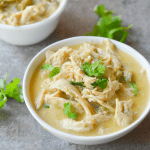 This Keto white chicken chili is super easy to make and takes as little as 30 minutes in a pinch, or can be cooked low all day in a slow cooker. Get all your updates and posts !! Thanks so much! I hope you loved the recipe. Send me an e-mail and we’ll get you signed up! Thanks! Phenomenal. Filling, flavorful, easy. I like to make my own homemade bone broth so I cooked a whole chicken and used the breast meat for this recipe. We like it spicy so I doubled the jalapenos. Looking forward to lunch today!!! We made this at the Fire House ..It Was Outstanding..
Aaaaaawsome! Made it on the stove,rather than crock pot and used rotisserie chicken. Mind blown with sour cream and cheddar on top! Thank you for this awesome recipe!???? I used 4 chicken breasts and it was perfect…hope that helps. I used the whole Rotisserie chicken Cheryl! This was heaven! I’ve been missing my chili and now I won’t. I’ll make this again! Perfect, Sam’s club here i come… Thank You ???? I used the breast meat from two full rotisserie chickens. That equaled 1 lb in weight. Haven’t tried this yet. Just found it this morning. Just wanted to say I love using rotisserie chickens for chili, pot pie, chicken & dumplings and matzoh ball or any other chicken soup. You’re one smart cookie. Made it on the crockpot. 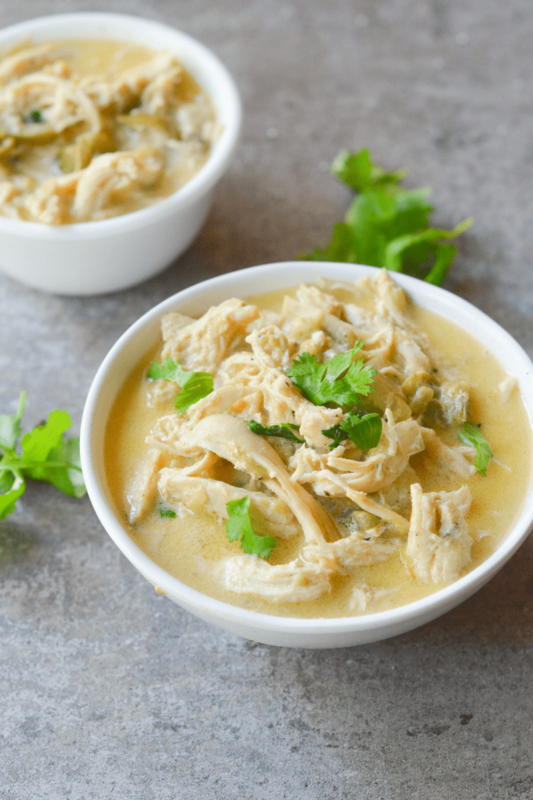 Easily my new favorite keto white chicken chili! I think I’ll add xanthan gum next time to make it a little thicker, but this was delicious! Thank you! Just made this this morning with “Friendsgiving” leftovers and homemade turkey stock. Just a hair different tasting than chicken but with all the other deliciousness, it was a huge hit with the family! I did add some chopped spinach too for an added veggie boost. how much ckicken broth? is it 1 1/2 cups or 5 cups? Are the nutrients based on a bowl of the chili? Or whole recipe? OH my yum! I just made this using the packaged rotisserie chicken from Costco (my fave bc it’ so easy and soo much flavor), and I also added a can of the rotel tomatoes with the chilis. I didn’t have any other veggies besides onion, but the tomatoes bulked it up and it’s so great! I’ll definitely be making this again. I didn’t even miss the beans! Seriously the best thing we have eaten on Keto!! Will double or triple batch next time for leftovers. Followed your recipe exactly and it was delicious! Made Keto cheddar jalapeño biscuits as a side and we are all in heaven!! Hi Niki! Can you post the recipe for the keto cheddar jalapeno biscuits? Thanks! Ho.ly.Moly. This was amazing! So simple, yet SO tasty. Added mushrooms and amped up the spices. That cream cheese + HWC trick? Genius. For sure making this again! Hey there! Why is this considered a Keto recipe? Aren’t Keto meals supposed to be proportioned 70/20/10 for fat/protein/carb? This recipe has more protein than fat. Thanks for clarifying! 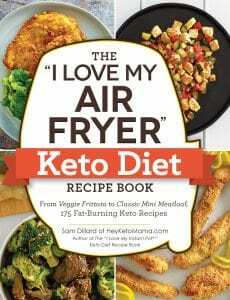 I have been doing Keto since August and continually look for great recipes! Your overall macros for the day should be within that range, but each individual recipe doesn’t need to be. It’s totally fine if you eat something with more more protein than fat at a meal as long as it balances later in the day. It’s mostly about finding what works for you and keeping your net carbs as low as possible. If you can completely balance a recipe 70/20/10 then that’s great, but I think personally it’s easier to plan it out and sometimes eat more protein here, or more fat there. [think, fatty coffee for breakfast, more protein at lunch to make up] Congrats on being Keto since August! I hope that info helped. This far exceeded my expectations and would be a great weeknight meal. I didn’t even measure anything. It seems quite versatile and easy enough to make non-keto, or to spice it up with garnishes. Could I just put all ingredients into crockpot and shred chicken at the end? When cooking in the crockpot, do you sear the chicken first? tried to sign up for email. Wouldn’t take my email address. What now?? Hmm, I tried it too and it wouldn’t work for some reason. I’ll go ahead and add it in manually for you. Thanks so much! This was great! Finishing up a bowl of it right now. I love your blog, it has helped me a lot through the first few weeks of Keto! This was delicious! The best white chicken chili ever! My husband loved it too. I did use a whole rotisserie chicken and it was prefect. Thank you so much! Lol……..sorry, but my brother won’t fit in the pan and wasn’t interested in being cooked. Sometimes the spellcheck problems can be so funny. Happy holidays!!!!! Thanks for this recipe! I am now officially addicted to this soup! so delicious! 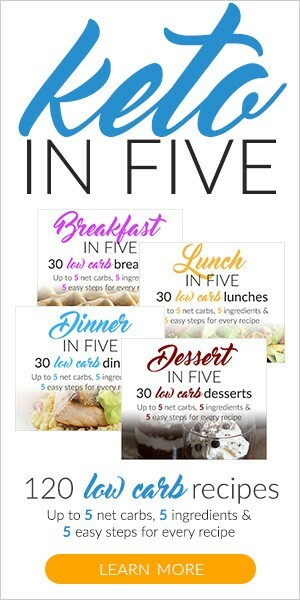 makes eating keto so easy. there’s a good amount of spice to this and i added in a bit of Rotel diced tomatoes with habaneros in at the end. yum! this is going to be my lunch all week (with a little bit of cheese sprinkled on top)! I have a question ….. if you use a rotisserie chicken, do you just put in pot and add broth and continue from there according to the instructions? Since is already cooked do you skip seasoning and searing ? This was amazing and I didn’t miss the beans! I cut a low carb tortilla in strips and fried in some olive oil to add a little crunch on top. Don’t forget the cheese and sour cream on top too! This was AWESOME! So easy to make. Followed recipe to a T and loved it. are they for the whole recipe? Hubs couldn’t stop raving about this dish! New fav to go on our dinner rotation ???? One of the best soups I have ever made!! So much flavor! 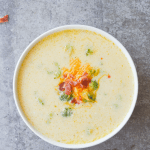 and so easy to make.This is on my top list of soups! Thank you so much for sharing. Made this tonight and it was perfect. Knocked out my cravings for something savory. Thank you! Back on my Keto train and need to stay on…. Tried this tonight and def8nitely a keeper. This was delicious! I don’t love green peppers and didn’t have any so replaced them with about 2 cups of chopped fresh spinach and it was perfect! I also added about a teaspoon of chili powder just because. Served it with pepper jack grated cheese, avocado slices, chopped green onions and a dollop of sour cream and I am SO full! Doubled the recipe so I’m looking forward to having this for lunch again tomorrow. Thank you for sharing this recipe. I added chipotle powder to the chicken and topped the chili with avocado, cilantro & Monterey Jack Delicious! I will be making this again. I love this recipe. The only thing that I would change is the cayenne pepper. The first time I made it I added less than a quarter of a teaspoon of cayenne pepper. And it was really good. The second time I forgot how much I had put in and so I used the full quarter teaspoon of Cayenne. I am one that likes to have things spicy but I also like to be able to taste the food and not just the Heat. So from now on I will Start with a little amount and add to it as I feel I need more heat. So glad you enjoy this yummy dish! Good tip for handling the spice! The nutritional values do not include toppings right? Is there something I can substitute the heavy cream with as I’m lactose intolerant but desperately want to make this! Thank you I hope there is a replacement! You could just leave out the cream. Your dish won’t be creamy, but it should still be very tasty! How long do you continue to cook in Crockpot after you add the heavy cream? So good. I was surprised at the flavor! It wasn’t thick like chilli so it looked at little bland. Boy was I deceived! Very flavorful!! I put in serving sized containers and froze. Take to work for lunch a couple times a week. Will make again! This is such a good and easy recipe. My whole family enjoyed this as dinner last night!! Thanks for sharing!! I can’t wait to make this! When using a crockpot, am I putting the chicken in raw? And then doing 4 hrs on low? Thank you!! Oh my goodness! This is amazing!!! I used the Instant Pot to cook the chicken with the spices. Then added the peppers and onions for a couple of minutes then added the cream and cream cheese. One of the best things I’ve tastes! I made this tonight, it was awesome!! I used a rotisserie chicken and I used two fresh ploblano peppers diced and sautéed with the. Jalapeño and onion. So good! I will be mailing this again! I just want to say thank you for this recipe. I can’t even believe I haven’t commented yet. I’ve made this for my family probably eight times over the last four or five months, and it’s always a hit. I’ve also made it for friends watching their weight and they loved it too! I am so grateful to you for sharing this! I don’t even do keto, and it’s still scrumptious. Thanks again! I made it last week & there were no left overs. My whole family loved it. I made black beans with corn to go with it & it was delicious. I’m making it again tonight sooo good. By far, my favorite keto recipe ever!!! I could eat it every day, even in the summer! I made this tonight! OMG it was so yummy! My guy ate two cups of it which gave him the fat he needed! Thank you for this awesome meal! I will double it next time! I made this to take in a thermos to a football game. I cheated, using a can of chicken, added some nopales,; it was super delicious! Thank you for sharing. Fantastic recipe and easy to make. I substituted the jalapenos and chilies with a small can of Costeno Chiles Escabeche which we find in Mexico, The recipe turned out perfect. I did omit the cayenne in lieu of the fact that I used the canned chilis. Great recipe!! Will be adding it into my regular rotation. I made it in my Instant pot and it was great! Anyone know how to convert this to an instant pot? I havent made it yet but ut sounds heavenly, only question… my husband doesn’t like onions i have tried them every which way and he seems to still find them. If i took them out how much of a difference will that be as far as the carbs go? Thanks for this recipe! My family really enjoyed it this evening. Will definitely make this one again! Omg! So delicious! I had to adjust the ingredients because we didn’t have cumin so we added turmeric and curry instead. I also added 2 more cups of chicken broth because it wasn’t jucy. ALso, we added a jalapeno and it is so spicy and delicious! Will be making it again! Made it tonight for the first time and glad I doubled the recipe. We loved it and ate it all!! Filling and tasty. I got creative and added several more pepper types, since they are plentiful in the market. Added some pepper jack cheese while cooking to thicken it as well. Heavy with the sour cream and cilantro as a topping. This is a keeper !!!! Thanks!!! So tasty, cant wait to share with friends. I fid add navy beans for fiber. But i love a great soup. I also used an entire baked chicken and shreddedall the meat so it isnt as pretty. Thank you for sharing. I currently have mine cooking in the crockpot. I am making a double batch for left overs because based on the comments we are going to love it. Question though because I’m reading mixed things; I literally combined all ingredients and have it on high and plan to shred chicken at the end. Is that ok? You mentioned the heavy cream doesn’t need to “cook” but isn’t that the idea of a crockpot, that regardless of ingredients just put them all in? I really loved this recipe but when I made it (in the crock pot) it didn’t really “blend together”. I want to make it for friends at work but want it to blend more. Do you put the cream cheese in the crockpot from the beginning or do you wait to add it with the heavy cream? I just made this! Wow! Delicious! So glad I made a double batch, hoping there will be leftovers for my lunches this week. Hi! Please clarify the amount of chicken broth. I added 1.5 cups and by the time the chicken finished cooking it had completed reduced to nothing. Ended up adding a whole carton of broth. What type of chicken for the nutrition listed? Breast? Thigh? I used chicken breast for this but feel free to use thighs for more flavor! Thanks for catching that! Just finished eating and it was a hit! Followed the recipe to the T and it was perfect except for one thing…..I didn’t make enough, lol! Will be doubling, if not triple it next time!! Thanks for the great recipe! Does the jalapeño make it very spicy? 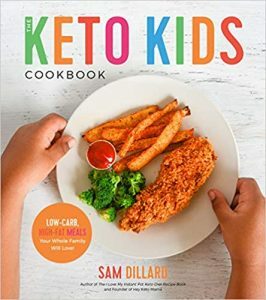 I’m making this for a friend who is eating keto but she has two children who don’t so much spice…. I left out the green chili and jalapeños, as my fiancé can’t handle spice due to his gastroperesis. Does that change the nutrition facts any? Absolutely LOVE this recipe!! Easy and OH so good. I’d made a pot of it along with a pot of red chili (also keto) for a potluck at work. This keto white chicken chili was the first one GONE. My daughter has made it as well based on my ravings and absolutely loves it. Great recipe. I modified by: adding 2 cups of riced cauliflower, used 7 chicken thighs, used 4 cups of broth (Better Than Bouillon is my favorite), and 1/2 jar of Herdes Salsa Verde. Next time I might add some lemongrass! This was absolutely delicious! I ended up throwing all the ingredients in a croc pot, on high, for 5 hours. I also added lime and riced cauliflower with one hour left. Can’t wait to make another pot! This was a winner in my house! I quadrupled the recipe and watched as eight boys, ages 2-14, wolfed it down, destroying any hopes of having some leftovers for my lunch. Made a big batch of keto cornbread to go with it, which was also a winner! This was delicious. Everyone, including my picky eaters, loved it. Thank you so much!